Tucker Hall is an academic building located along the north side of the Sunken Garden near the Wren Building. 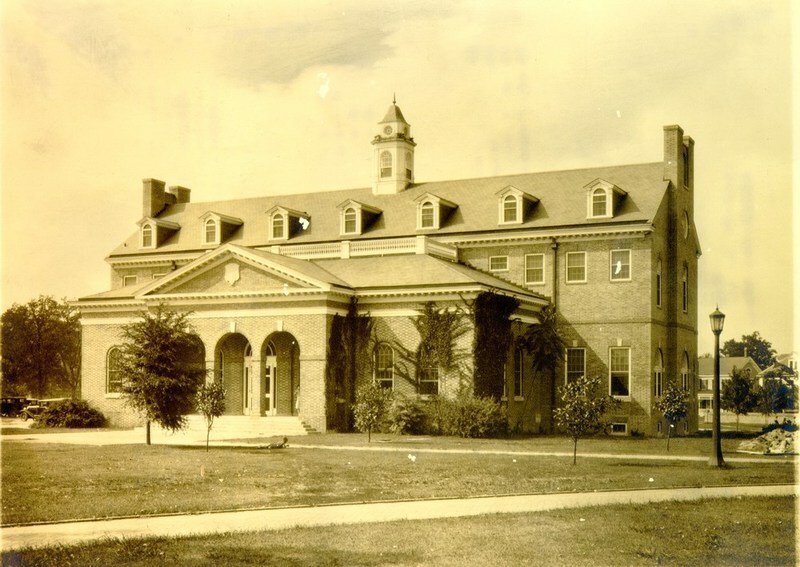 It was originally constructed as William & Mary's first dedicated library building and served as such until the opening of the Earl Gregg Swem Library in 1966. Today, Tucker Hall houses the Department of English and several classrooms. In 1905, Andrew Carnegie pledged funds to build the university’s library and the cornerstone was laid in 1908. The library in Tucker Hall was dedicated and opened to the public in 1909 and housed over 12,000 volumes. Dances were held in the library in 1920. The building was renovated a number of times as the university and its library collections expanded. In 1943, during World War II, an airplane spotting station was moved into the library tower. 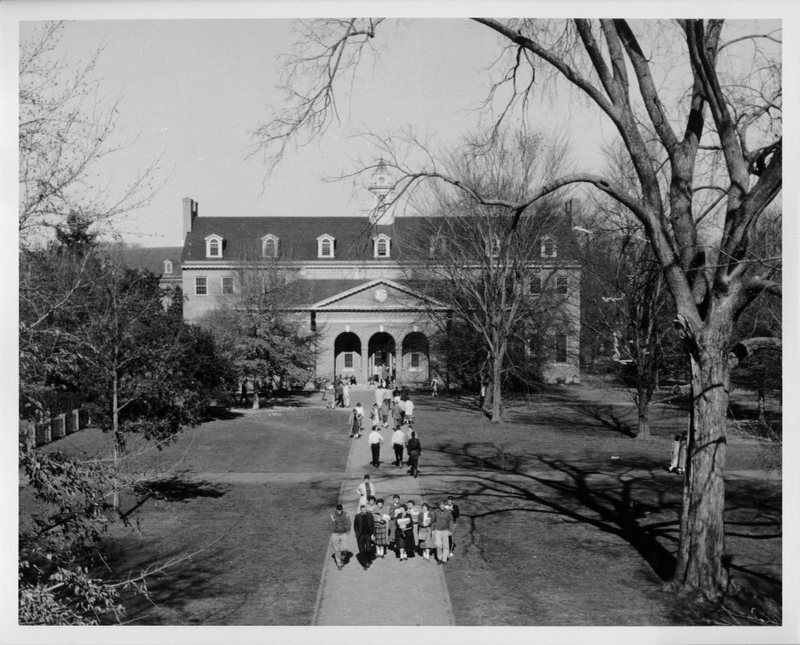 In 1958, as a result of increased enrollment at William & Mary, a new library building was proposed and opened in 1966 as the Earl Gregg Swem Library. Shortly afterwards, the building underwent renovations to prepare it for its newest tenant: the Law School. The building was renamed Marshall-Wythe Hall in 1968. 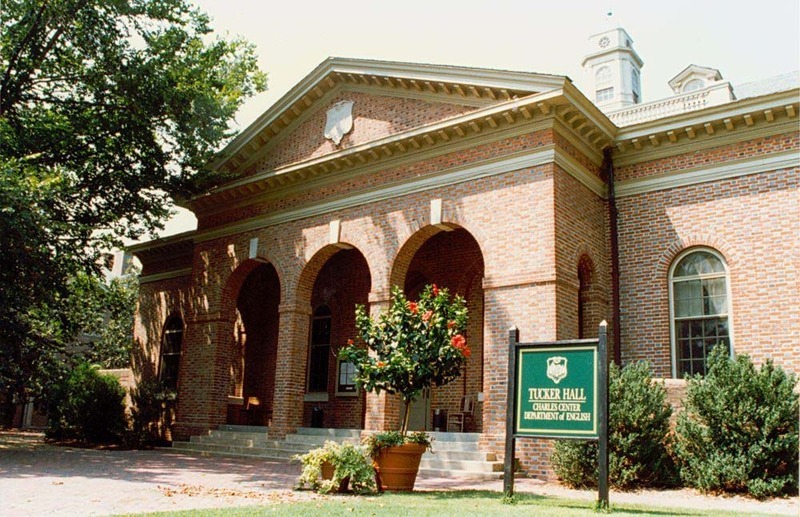 In 1980, as the law school moved out to its current location on South Henry St. and the English department moved in, William & Mary changed the building's name to Tucker Hall in honor of former law professor and Revolutionary War veteran St. George Tucker. Tucker Hall, 1996: The front exterior of Tucker Hall in 1996. ~ Source: University Archives Photograph Collection, UA 8. ~ Creator: College of William and Mary. 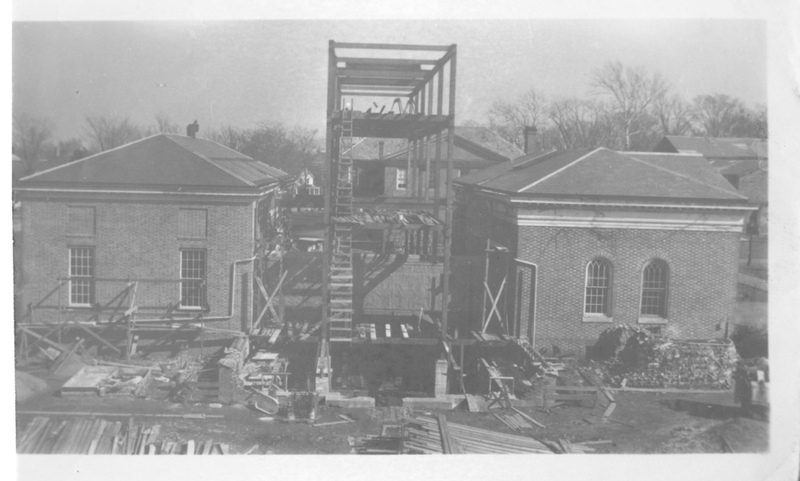 Old Library during renovation, circa 1929: The Old Library, now known as Tucker Hall, during construction around 1929. ~ Source: University Archives Photograph Collection, UA 8. ~ Creator: College of William and Mary. Old Library, 1918: The south facade of the Old Library, now known as Tucker Hall, in 1918 . ~ Source: University Archives Photograph Collection, UA 8. ~ Creator: College of William and Mary. 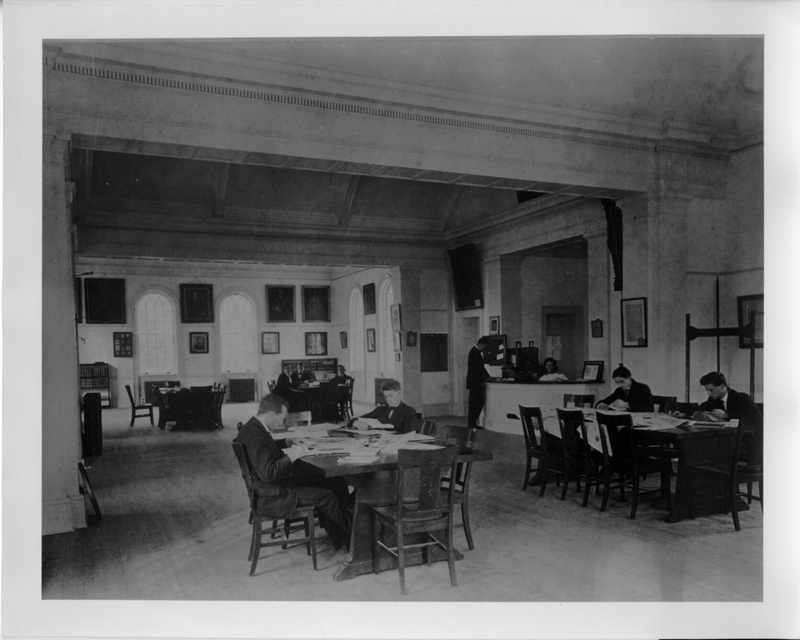 Students studying in the Old Library, 1919: Students studying in the Old Library, now known as Tucker Hall, in 1919. ~ Source: University Archives Photograph Collection, UA 8. ~ Creator: College of William and Mary. 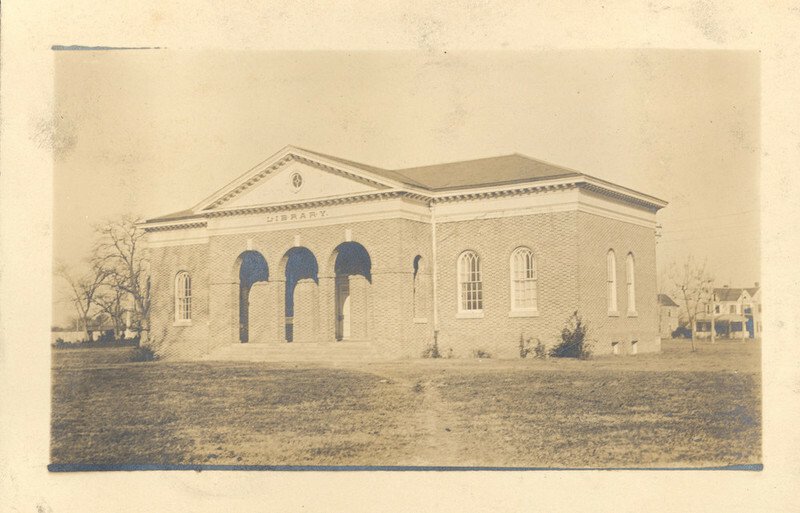 South facade of Old Library, circa 1925: The south facade of the Old Library, now known as Tucker Hall, circa 1925. ~ Source: University Archives Photograph Collection, UA 8. ~ Creator: College of William and Mary. 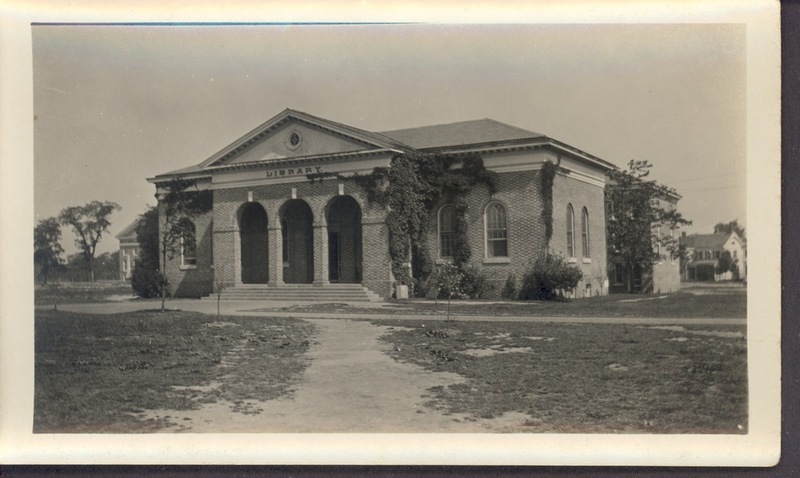 Old Library, 1930: A sepia image of the front exterior of the Old Library, now known as Tucker Hall, in 1930. ~ Source: University Archives Photograph Collection, UA 8. ~ Creator: College of William and Mary. Old Library, undated: View of Old Library, now known as Tucker Hall, from upstairs in Ewell Hall, undated. ~ Source: University Archives Photograph Collection, UA 8. ~ Creator: College of William and Mary. 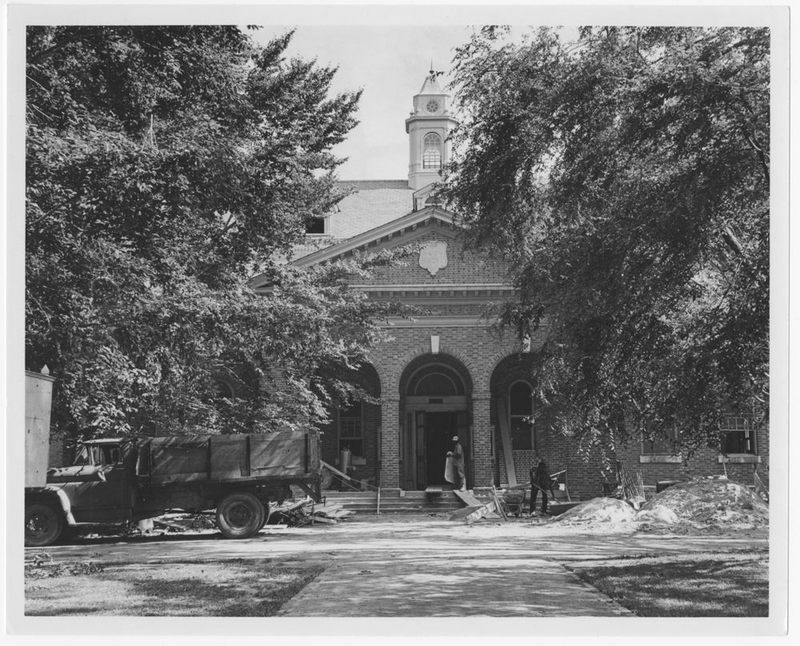 Old Library during renovation, circa 1967: The Old Library, now known as Tucker Hall, during renovation and conversion to house the Law School, circa 1967. ~ Source: University Archives Photograph Collection, UA 8. ~ Creator: College of William and Mary. 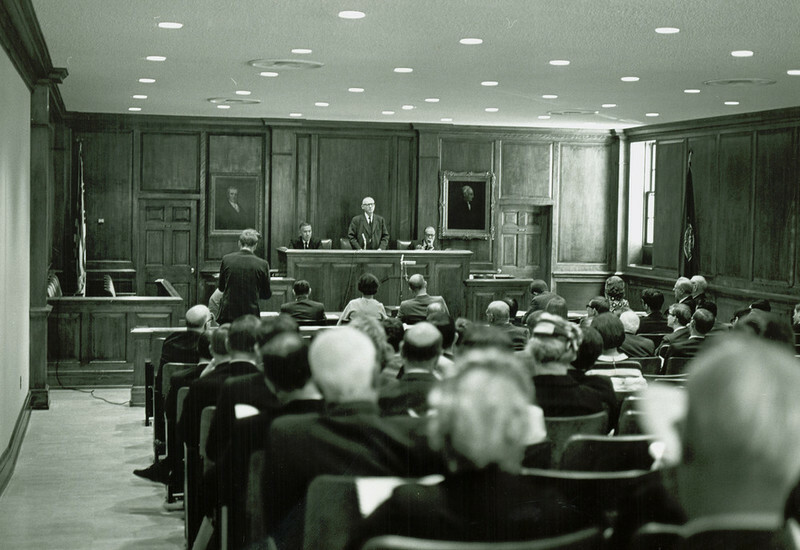 Courtroom at the Marshall-Wythe School of Law, now Tucker Hall, May 1969: A photo of the moot courtroom dedication at the Marshall-Wythe School of Law, now Tucker Hall, in May 1969 with President Davis Y. Paschall. ~ Source: University Archives Photograph Collection, UA 8. ~ Creator: College of William and Mary. 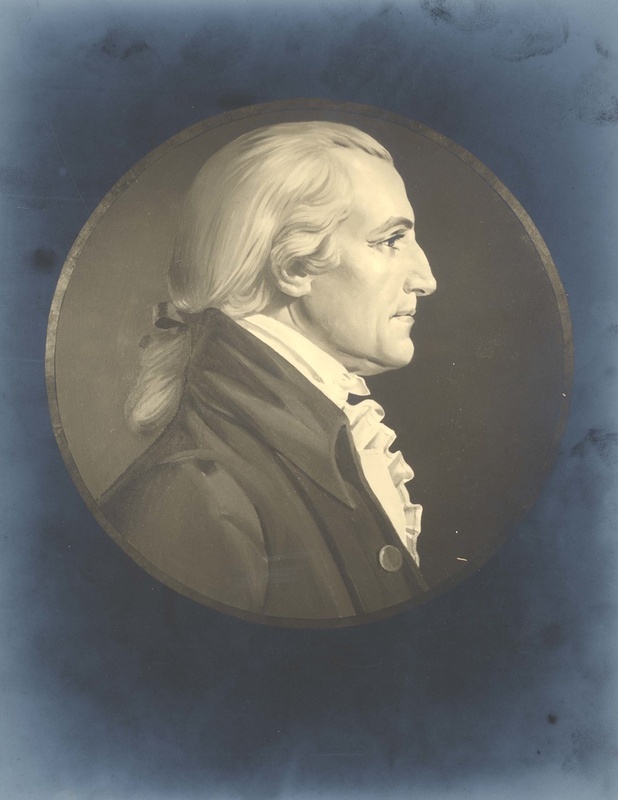 St. George Tucker, undated: Photograph of a portrait of St. George Tucker, second professor of law at William & Mary, by Bethuel Moore. ~ Source: University Archives Photograph Collection, UA 8. ~ Creator: College of William and Mary. 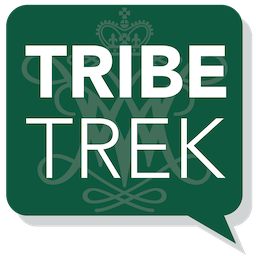 Special Collections Research Center, Swem Library, College of William and Mary., “Tucker Hall, Constructed 1908,” TribeTrek, accessed April 26, 2019, https://tribetrek.wm.edu/items/show/9.